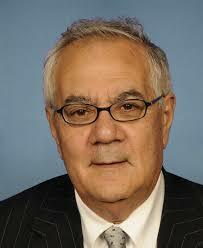 Former Congressman Barney Frank, a lead co-sponsor of redefining Wall Street legislation after the 2008 recession, will candidly discuss President Trump’s efforts to dismantle the law. The Massachusetts Democrat will join Dr. Elmore Alexander, dean of the Ricciardi College of Business at Bridgewater State University, on Wednesday, April 5 at 1 p.m. in Boyden Hall’s Horace Mann Auditorium. The Dodd-Frank Wall Street Reform and Consumer Protection Act, co-sponsored by former Senate Banking Committee Chairman Chris Dodd, was signed into law in 2010 brought sweeping change to financial regulation in the U.S.
President Trump has called Dodd-Frank “a disaster,” saying it has prevented banks from making loans and last month ordered review of the law. However, Congressman Frank said he doesn’t believe that the Republican Party has the will, nor the ability, to dismantle the legislation which was designed to prevent banks and financial services companies from repeating the mistakes that led to the 2008 recession. The event is free and open to the public and the campus community. On-campus parking for visitors is available at the parking garage at 451 Great Hill Drive. For more information, call 508.531.6151 or email stephanie.jesse@bridgew.edu.